Eggs are high in Protein, low in fat and incredibly healthy and tasty. Eggs in breakfast give the feeling of satiety and also has so many nutrients which perfectly fits for your daily requirement of body and mental strength. Eggs contain essential fatty acids which help the body to function properly. According to 'Health Center', if the body lacks these essential fatty acids, you may experience chronic fatigue, poor skin, and hair, loss of muscle strength and weakened the immune system. White and brown eggs are identical or different? Many people have the questions like why eggs color differ? What is the difference between white and brown color egg? So answer given by Eggs.ca. Aside from the color of eggshell, there is a little difference between white and brown egg. The eggshell color depends on the breed of the hens. Nutritionally, both brown and white eggs are identical unless the feed has been enhanced. Each large egg contains 6 gram of protein and 14 essential nutrients like Vitamins A, D, E, folate, iron, magnesium, potassium, selenium, and zinc. Eggs are one of the few foods considered to be complete protein because they contain all 9 essential amino acids. To keep its nutritional value high or constant, store eggs in the refrigerator because of egg age more in a room temperature. One egg meets 11 percent of the daily requirement of these vitamins. Let's look at the twelve powerful health benefits of the egg. Egg in breakfast helps to regulate appetite, lowers the risk of overeating, and helps to avoid food carving. Eggs give the feeling of satiety which helps to maintain weight and prevents from being obese. One large boiled egg weighs 5 grams of fat. One or two eggs helps in weight loss and perfect for a busy day. Our body produces 11 Essential fatty acids which are necessary for proper body functioning. You will be glad to know that Egg contains these 9 out of 11 Essential fatty acids. Eggs packed with Omega-3 fatty acid which helps to keep blood pressure balanced and cholesterol in check. Eggs are also good to improve symptoms of ADHD(Attention Deficit Hyperactivity Disorder). Eggs contain good cholesterols. One egg has 200 milligram of cholesterol which lowers bad (LDL) cholesterols and elevates the level of good (HDL) cholesterol. Decades of research have confirmed that dietary cholesterol does not affect blood cholesterol or increase heart disease risk. This helps to prevent heart disease and keeps blood arteries supple and efficient for long-term health. Egg contains powerful antioxidants which enhances vision and promote eye health. 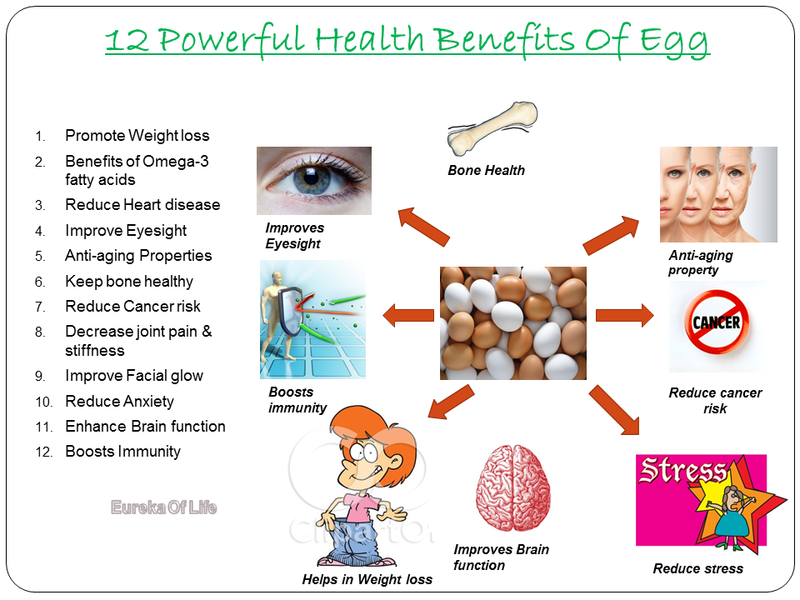 Consuming egg daily also lowers the risk of eye diseases like cataract and macular degeneration. Egg contains Vitamin A, Lutein, and Zeaxanthin these three powerful antioxidants which help to keep your skin healthy. Antioxidants in the egg that can prevent free radical damage and slow down the aging process. If you have egg on a daily basis then definitely, your skin will be wrinkle free and glowing day-by-day. Egg also contains organic pigments like carotenoids which can slow down aging. To get the full benefit from them you need to eat the boiled eggs since they contain more carotenoids. Eggs are rich in vitamin D and calcium, these both nutrients are essential for strong bones. Vitamin D and calcium are crucial for growth and development of bones. Amino acids like tryptophan and tyrosine present in the egg, which has potent antioxidant properties to help prevent cancer. According to "Breast Cancer Research" journal, eating eggs every day can reduce the risk of breast cancer by 18 percent. Furthermore, eggs contain a lot of amino acids, vitamins, and minerals that will stabilize your estrogen levels which is responsible for breast cancer. 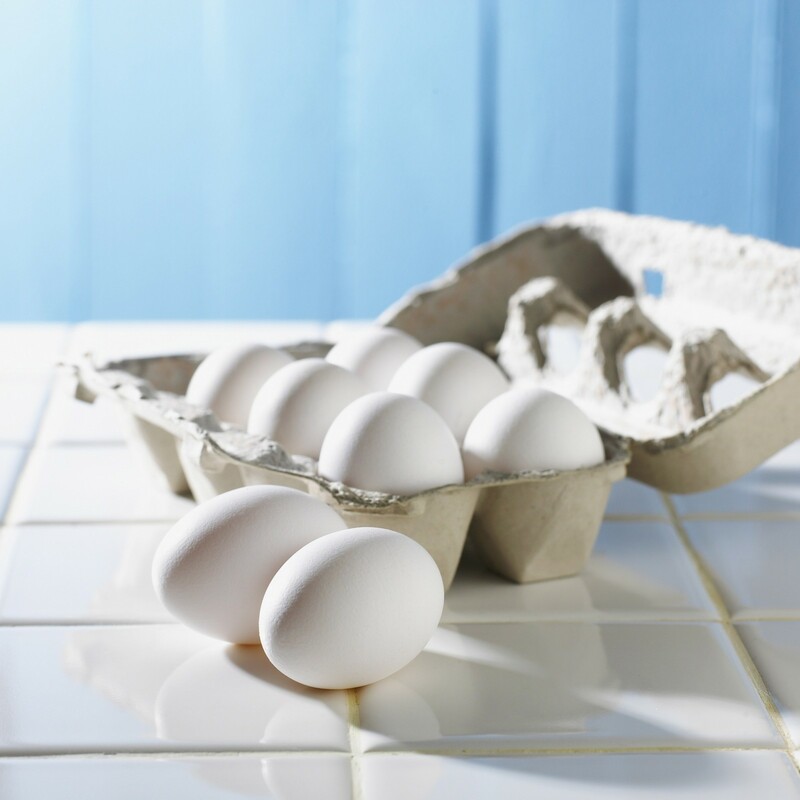 Egg contains two types of collagen- type I and type V. Egg white are commonly used as a beauty treatment. Collagens in egg prominently improves skin texture by promoting collagen level in the skin. Use of egg white facemasks brings a clear glow to the face. Egg naturally contains collagen and collagen-promoting nutrients like vitamins B, E, amino acids and sulfur. The high collagen content of egg's membranes makes it especially helpful in the treatment of Connective tissue disorders. The most prevalent form of arthritis is Osteoarthritis which currently affected millions of individuals worldwide. In osteoarthritis protective cartilage in between the joints wears down over time and causes severe joint pain. Eggshell membranes containing a good amount of collagen which has shown to reduce arthritic pain and stiffness due to osteoarthritis. Eggs hold essential amino acids like tryptophan which regulate the release of serotonin. Serotonin is an important neurotransmitter which is derived biochemically from tryptophan. Serotonin which is responsible for relaxation of the brain, calmness and for good mood. Vitamin-D presents an egg helps to combat depression and makes the happy mood. Hence, egg helps in reduction of stress and anxiety. Egg contains choline, an important neurotransmitter in the brain. Neurotransmitter like choline sends stimuli to the brain. Cognitive effect impairs due to its deficiency. Consuming egg daily provides sufficient amount of choline to the brain. An egg or two can help you fight infections, as an egg is the rich source of selenium. Each egg holds 15.40 mcg of selenium. Selenium is an element which is extremely beneficial for a healthy and strong immune system. As you know eggs are incredibly healthy. Eggs helps the body to function and regulate properly. This why experts recommend eating 2-3 eggs a day, except in cases of diabetes or heart problems, when you should eat only 3 eggs a week. Yes there are things which works like wonder in health for veggies people.. Soon I will write on it. thanks pramila its a very good article as i m vegetarian after reading ur article surely i will start eating eggs.